Discussion in 'Displays' started by Wag, Jan 8, 2014. Here you go. Direct confirmation from Asus that this one does 60Hz @ 4k. Not only that but it has a 1ms response time. I don't think I'd buy 4k on a 28" display, but that's pretty crazy. MSRP of $799 isn't bad though. Might be saving my pennies for this.. If the reviews are good I'll pick one up to go with dual 290's.. It's probably a TN. And 28" is too small. Yeah, TN and 4K on a 28" seems problematic, nevermind the price tag. I'm just not willing to pay 800&#8364; for a monitor unless it's absolutely superb. Looks like it's one more year with the UH2713HM for me. will be coming a same product but whit 24inch like Dell ? of course it's a TN, the 1 ms response time tells you that. what did you expect? there's no way you're getting a 4k IPS for $800. Hmmm if its that high quality TN Asus talked about with the 27inch ROG one they are releasing, this could be an interesting alternative. Ticks all my boxes -- 100% guaranteed buy. Any idea whether this'll do 1080P@120Hz like the 50" Seiki? This isn't the same as their 24" or the 32" though. This one is a hybrid supposedly between the two. I take that as its something not as good as either. Have to wait for some actual reviews. Personally, I like the size of the 32" better. I have a 28" LCD and its really nice but something a tad larger is what I'm looking for. Given that Dell and Lenovo are releasing very similar monitors in the same timeframe, I'm guessing they're all based on the same panel. Same panel perhaps. But the internals could be better. The dell supposedly only does 30hz. Maybe this one can do 60hz? Here at CES 2014 the new PB287Q is being unveiled offering up 28 inches of 4K resolution, 1ms response time and native 60Hz operation. Based on a newly developed panel that is lower in cost but not in quality it allows the new PB287Q to be aggressively priced with a projected $799 MSRP. Well ya it is a TN panel so it's cheap and image quality won't be up there with the IPS 4K panels. The thought of the massive excel spreadsheets I can do with this is just......pants tightening. I will buy this monitor purely for work. Glorious. The exciting thing about 4K is that it might start driving PC hardware progress a bit harder than it has been over the last couple of years. 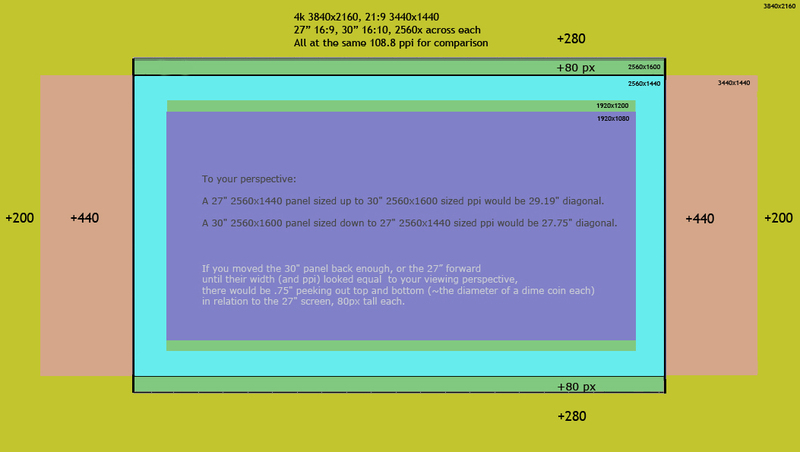 If this panel is doable, who's going to pay $2500 on the 31.5" 3840x2160 panel? RTS games show greater areas better, flight sims and space sims show more detail and contacts are identifiable at greater distances. 21:9 actually shows more field of view on most games. Most games 16:9 = 16:9 and all objects are the same size in the scene in relation to each other and the scene, the pixel density just changes to higher detail. It's like lens, called a virtual lens. However a few games might break out of that, or with or without mods/hacks allow zooming out further than normal to get more out of higher resolutions to see more game world real-estate at the same 16:9 aspect ratio. Screen size comes into play then though, as things could be way too tiny in games, even RTS's zoomed out further than normal on a 28" 4k running rts or isometric rpg. There are some 144hz g-sync 21:9 3440x1440 panels due out this year and into 2016. Mfg's won't be able to make 120hz input 4k screens until dp 1.3 - 1.4a inputs are on them and like outputs on gpus. The 4k push (esp for gaming) is all marketing at this point. On games it's inferior hz for motion defintion/articulation and for blur reduction/image clarity, as well as being a frame rate sink hole. Dual beefy gpu sli at 1440p can barely (on ultra) get 100fps ave right now and on the most demanding games maybe 65 - 70fps. 4k makes pretty still screen shots for wallpaper, 4k threads and marketing pushes though. 4k content is sparse for movies too, and some "4k" movies are 2k upconverted. That said, 4k for desktop/app real-estate is a big difference in space. Outside of 4k for desktop/apps use, 4k will definitely be the way to go in the long run (or a higher than 4k 21:9 version hopefully) but for overall gaming aesthetics (including motion quality and blur reduction/clarity) it will be inferior for quite awhile yet, measurably. There will also be VR for gaming going forward too. edit: note that some 4k screens can accept 120hz input at 1080p resolution.